The crew at Volume Bikes coming through with a promo video for their new 2018 Sledgehammer Bike thaat is available now! Hit play to watch the bossman, Brian Castillo, put the bike through its paces on some off road terrain! She might not be the prettiest bike you’ve ever seen, but it can take a beating. After you watch the video, get the full specs and details on the bike right here! “The all new 2018 Volume 26″ Sledgehammer klunker is one fun bike to ride, jump, cruise, and mob around on. 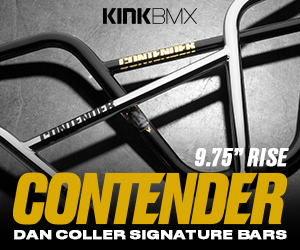 Built around the early 70’s style klunker mountain bikes with a modern twist equates to an awesome riding bike that can take whatever you can dish out. Volume Bikes just released a new Bike Check with a custom Vessel V2 frame they built up and decked out with all the latest Volume Bikes and Demolition Parts! Based off Brian Castillo‘s Instagram, we would be willing to bet this is his new bike that he will be rolling around on. Perks of being the boss man! Volume Bikes dropped the mix section from “The Finer Things” online for your viewing pleasure! This section contains riding from Brian Castillo that we’re super stoked on along with riding from flow / am riders, international riding and a ton of friends of the brand. This is one BMX video worth checking out! One thing we don’t always get a look at are samples of products that are on the fence if they will happen or not. But sometimes a funny idea ends up turning out to be something people want (Roseanne Bars / Perfect 10’s for example)… Volume posted this photo of some 9″ Mad Dog bars that Brian Castillo cooked up for himself that some of the guys are actually thinking would be cool to produce. They’re looking for your opinion on these, so hit the link to their site and let them know what you think in the comments! I haven’t seen fresh Brian Castillo footage for quite a while, so it’s rad to see that he can still shred! Adam22 gets his grind on and scoops up a brand new Enns frame, the Volume Cerberus.